The Pike is a jump that requires cheerleaders to have great flexibility and explosive power. Increasing a cheerleader's flexibility and power is one of the most beneficial ways to improve the skills needed to perform this jump at a higher level. Myosource Kinetic Bands provide resistance to help cheerleaders increase strength, flexibility, balance, momentum, power, and body control. Cheerleaders who utilize the Myosource Kinetic Bands are successful in improving their skills and jumps because the bands do not restrict or limit any movements and allow them to practice just as they would perform. Our cheerleading combo (Cheer Kinetic Bands and Stunt Strap) includes a set of leg straps, two sets of resistance bands with 2 levels of resistance, and a stunt strap which is also great for increasing flexibility and stretching. This combo pack is inexpensive, small enough to fit in a cheer bag, and convenient to use anywhere. The cheerleader will start with the legs and feet together, standing straight up. The cheerleader will begin with the arms in either a V motion or in front of the chest with the hands clasped together. Both positions are used to provide a strong arm swing for an increase in upward momentum. If the arms are in the V motion, the cheerleader will swing the arms downward in a circular motion, crossing in front of the hips and thighs. If the arms are in front of the chest, the cheerleader will raise them directly above the head, with the hands still clasped together, and swing the arms downward in a circluar motion, crossing in front of the hips and thighs. Regardless of the starting position the cheerleader's arms were in, when crossing in front of the body the knees should be bent in preparation for the jump. The arm swing is used to utilize the muscle power in the legs to jump off of the ground as high as possible. 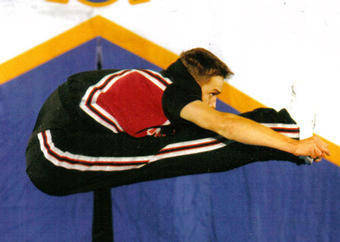 The cheerleader will jump and kick both legs directly in front of the body, bending at the waist with the arms stretched directly in front of the body as well. While in the air, the cheerleader should look as if she is sitting with the legs together and straight in front of the body. The idea is to get the legs and arms parallel to the ground when at the peak of the jump. Upon landing, the cheerleader should quickly stand straight up with the feet together, hands to the sides, and head high. Cheerleaders should sit on the ground with both legs straight in front of them, reaching for the pointed toes. This is also known as a pike stretch. Cheerleaders should practice their pike in front of a mirror in order to see what needs to be perfected. Since the pike requires an immense amount of flexibility, the cheerleader should always be thoroughly stretched before attempting this jump to avoid pulling any muscles. Cheerleaders should always keep the head up and refrain from looking down. Bringing the head down often causes the jump height to suffer. During this jump, cheerleaders must remember to bring the legs to the body and hands, not the hands and body to the legs.